Hello and happy Tuesday. 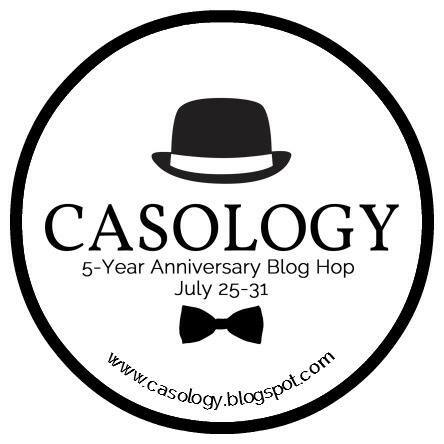 This week, we are celebrating our 5 year anniversary at CASology with a blog hop. If you are hopping along, you should have arrived here from Kymona's blog. If you want to start the hop from the beginning, click here. 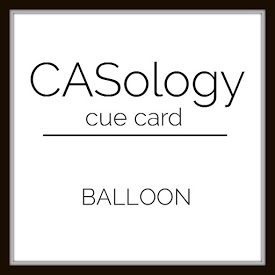 This week, our cue word is Balloon. A very fitting cue word for our week long celebration. I made a birthday card, masking and layering a festive grouping of balloons. I hope that you will hop along with CASology this week. There are so many prizes from our many sponsors. You will also get to hop along and see some creations from our previous DT members who have moved on to other things over the years. Your next stop on the hop is Rosemary's blog. Information about the hop and the prizes can be found here, at the CASology Home Page. Now it's your turn. How does BALLOON inspire you? I hope you will hop and play along this week. Please remember to keep it Clean and Simple. What a fun card. I love all the colors and layers you did. Great Job. Gorgeous card! Love all the masking you did! Fun card! Love the masking of the balloons! Really beautiful card! Fun technique thanks for sharing! So pretty. Love all those balloons in this CAS design. Love all the colour, I almost used those balloons for my card! Bright, bold and festive! Beautiful card!! Love the balloons!! Lots of balloons! Love this card! Really beautiful in such bright colors! Now that's a lot of balloons! Great card! So pretty. Enjoyed your cards on your blog too.. especially the sympathy one with grid work in the background, with a flower die cut overlay. Love all those colorful balloons! Beautiful card! Thanks for sharing! Nicely done....love the way you put all the balloons at the to of the card base. Pretty colors too! So cute! Love how you stamped the balloons! Lovely card. The colourful balloons are very pretty. I love your bright and colorful balloons! They feel like a celebration, and are very pretty! Fun card ... love the masking, colors and details on the balloons, Joyce. Lots of color and lots of masking. Impressive card. If you couldn't have a party with those gorgeous balloons, then you don't deserve one. Fabulously done. I am always inspired by balloons to add them on birthday cards as they are so festive. Joyce, these particular balloons are awesome. A great job on your card! Great masking technique and using such vivid colours. Love all the colorfully layered balloons! Gorgeous colors on a lovely card! Joyce...thanks for all the wonderful challenges and kind comments over the years! Thanks for sharing and the inspiration to keep it simple! This is great - love these bold colours! Vibrant and so pretty! Love this card. Your card is amazing! I love the design on the balloons. Oooh, love those balloons. Wonderful colors. What a cool card! Love those colorful balloons! A-mazing colors and lots of beautiful white space ..... love, love!! Such a pretty balloon stamp - and I love balloons - and such gorgeous bright colours too. Just as an aside - you could link this up to AAA Cards Rainbow Challenge. Love the balloon you used here, very pretty! And an awesome card. Sweet card! Love your colors and how you've dressed up your balloons. Joyce, you're always the life of the party! LOve seeing you create with the cue each week - no surprise: always fabulous! Congratulations! Love the primary colors. Thanks for sharing. I love that the balloons have that festive design on them. Fabulous balloon card Miss Joyce...love those bright beautiful colors. Love the colors! Great card! love the colors you chose for all your pretty balloons - great card, Joyce! What a perfectly lovely card! Love all the layered balloons! Love all those "layered" balloons. Your colors are so pretty together. Beautiful work. Now that's a birthday card! festive! Your balloons are so festive! Love them and your whole card! Thanks for such a fun hop! What a pretty design Joyce and such happy colors too! I always enjoy and get inspired by your work for CASolgy! Looking forward to more! Love love your fun card. Great job! Such a festive design! Love all the wonderful colors! The festive color balloons look so stunning. The design on top of it adds more zing. Such a fun card! So cheerful! Such a beautiful, fun and vibrant card! OH! So many baloons! Love how the card turned out! WOW, that's some awesome masking for a perfect card. Those are super cute balloons! I haven't got the patience for t hat must masking! Love the bright balloons! I am working on mastering masking right now, so I am very impressed! Love the layout, you really make those balloons float! Balloons all over the ceiling.. Its a party! Your color combination is lovely. Great card. Love this bright, happy card! This is such a happy and fun card! My granddaughter would love something like this so you've inspired me to try a similar technique for a card for her. So many colourful balloons what a fun card love it now have I got any balloons I can use? I love the balloons!! Simple but decorative. Love the colors! Great card! Awesome card. Love the color combinations! Love your card and color combinations. I love the stars in the balloons! I am loving this fun stamp that you used on your card!! Great color combination!!! Great card!! Love the "starry" balloons!! What a bright fun color combination. Looks great with all those balloons. Great job of masking and stamping all the balloons with all the fun colours. Love the design,the balloons are gorgeous! What an amazing card! Love all of the bright, happy balloons!!! Love your card. Your balloons are fabulous. Love, love, love all the brightly colored balloons you used for the card!!. It made me smile seeing. Such a beautiful bunch of balloons! Awesome masking, too! Another fabulous card, Joyce! I love how you were able to include so many balloons yet your design is perfectly CAS! Love your color palette, too! Love all your pretty balloons! Great CAS design. Impeccable masking and stamping!!! I love the colours! I really like your card. It must have taken some time to have all the colors and so many balloons. very bright and colorful card! The balloons and colors are fantastic! Very nice card. I love the designs on the balloons. That's such a fun and happy card. Love the colors! I love the colors you used! So fun and bright! Great card, love your swirly, starry balloons. Love your balloon stamping!! Great image! Nice bright and joyful colours ! Love the way you layered all those balloons! Fabulous and bright card! Love it! These balloons are stunning in color and design. A true tribute to CASology's anniversary celebration. Thanks for sharing this card. That is just stunning. Love the silhouette cutout on the balloons. I like the colorful balloon party on your card. Thanks. How wonderful to see your creativity highlighted in this marvelous hop, Joyce! Your pretty array of festive balloons has certainly added sparkle to my day! Cheerful and charming! Love it! As you know: I adore allll your creations! Will be doing a catch-up soon! I love the designs on the balloons and all the great colors make this a very festive card! Fabulous balloon bouquet, so fresh and festive. Very nice. I love your layered balloons! Lovely and bright balloons :) Love your take! You've nailed the cue word as usual Joyce - love those ultra bright balloons! awesome masking! Wonderful balloon card! Wonderful masking! Love those festive balloons, TFS! Love your colors. Great CAS card! I like those fun balloons... both the colors and the cool stamp! Happy 5th anniversary, CASology! Love those balloons, so pretty! Lovely card it is...with gorgeous colours of the balloons! What a great card! All that masking! It must have taken ages! First thing I thought of when I saw this card was "wow, that took a lot of time to mask all those balloons". You definitely put the time into this card and it shows. So pretty! Oh wow, I love your colourful balloons! What a fun card - I love the colors you used, so cheerful! Your card is so fun and festive! Love all those colorful balloons! I am so in love with this card! It is so colorful, it has my favorite color which is yellow and which no one uses hardly at all except for me (LOL) and it is balloons! What could be better then that? Nothing! I love this card and wish someone had sent this to me on my birthday. Thanks for letting us see it and for giving us the chance to win something. I can't wait to win! I have a whole Pinterest board for balloons on cards! Love it! Great colors! Love the stamp too! Such a fun and festive card. Also love that the masking resulted in some tiny white borders, just enough to give the individual balloons a little extra definition. Great job on the masked balloons! Makes each bold color stand out more.